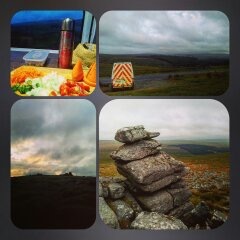 Dartmoor, on the night of the blood moon: we found a spot to park, walked ill shod to a set of tors - not too far, keeping markers in sight - the weather was coming in, blowing mist. Mist when stirred can thicken fast. We did not think we would see the red moon through the cloud but we walked anyway and climbed and felt the air around us and the pulse of the earth beneath. Wild horses were calling. The sky darkened. We tumbled back to the van to chop up vegetables and heat oil. Dog lay on her stinky cushion under the table, disdaining the clean water provided. Rain fell, a soft kind of rain. Mist was an intermediary between day and night. Someone somewhere will have a view of the red moon, the lunar eclipse. We have this. Before the heat rose Granma Grace and I strolled out. The quayside was in pre-bustle: shopkeepers propping signs for coffee or furniture or the lure of cake, bright kayaks being hauled in lines; people of two kinds: blurry from sleep, or scrubbed and fresh. The pull-across ferry on stand-by. 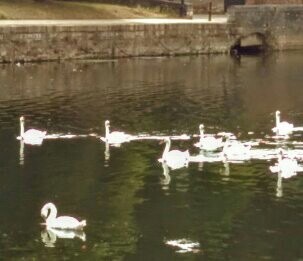 We stopped to watch swans - twenty in this fleet a-swimming, plus a straggler. We drift down to the flood defences where the reeds grow far taller than us. There’s a purple flower we can’t name, plantain in seed which we pick for the garden birds, and bindweed, which Grace calls granny-pop-out-the-bed. I tell her about the small dark fish swimming in the river weeds - her eyes won’t reach to that these days, but she can picture it. For a while we watch at the weir, where the gulls are noisy wheelers, where a cormorant flies and dives - Grace misses this too so I tell her, at first she thinks I said coal miner, a coal miner is diving. This too she had pictured - a grime blasted man, and his yellow safety helmet floating off. We take the high road back to see the reeds and flowers from above. ‘Is the meadowsweet gone over now?’ Grace asks, for she can’t spy any of those creamy-fluffs of flower. By the river though we see a puff of honey scented bloom, plus the six young swans still grey in plumage who are feasting in the weeds, bottoms up. How beautiful, we say, all along the walk and back, with a light breeze and blue sky and wildlife and reflections and happy dogs on the common. The kayaks are getting allocated to a group of school age children, we stop to observe: but our attention is taken then by the rising of a cormorant wrestling an eel. The bird is sleek black on a rippled shine of river, the eel is twisting silver eights. Three times we see the bird dive and rise, till it had gone too far down the waterway for us to follow. The lunar eclipse wasn't visible here, either, but one of my blogging pals in Australia posted some amazing photos of it. It really DID look red! I love swans! We saw a lot on our Europe trip. Got some lovely shots on a pond in Edinburgh.